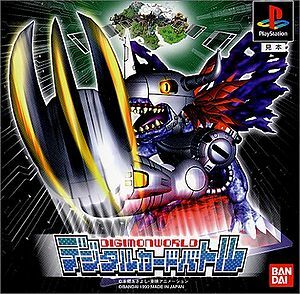 Digimon World: Digital Card Battle (デジモンワールド デジタルカードバトル, Dejimon Wārudo Dejitaru Kādo Batoru) is a video game. Similar to Digimon World, the plot is centered around the player, who is called to File Island and given a Digivice by Babamon. The island is in trouble because a dangerous card known as the Bug Card was excavated from the Ancient Dino Region, which is able to cause bugs within the Digital World, from minor bugs to major errors. Soon after the excavation, Ancient Dino Region's Card Leader Brachimon contacted Babamon in order to keep the card safe, but before Babamon was able to reach Brachimon, someone had stolen the Bug Card. As the Bug Card continues to go missing, its effects start to show slowly to Digimon around the island. Babamon is one such Digimon, now incapable of leaving the Village of Beginnings in its current form. This is the reason why the player is summoned to save the Digital World. The player's goal is to meet the seven Card Leaders around File Island and take from them the "7s" cards, which are required to reach Infinity Mountain, where all the data of the Digital World is processed, as well as to find the one who stole the Bug Card and bring it to the mountain, in order to revert the damage it caused and to prevent it from causing any further damage. The gameplay is heavily based on Digital Monster Card Game, except there is Hit Points system implemented on each Digimon Card. There are 159 cards of total in this game, which can be classified into three categories: Digimon Card, Option Card, and Evolution Card. Digimon Cards can be divided into five specialties: Fire, Ice, Nature, Darkness, and Rarity. These cards can be bought or sold at Card Shop. There are also 7 rare "7s" cards, each of them having a powerful effect. Both players should have a deck with 30 cards that is placed face down. The player can only create 3 decks at a time. A deck can consist of maximum 4 identical cards. To decide who battles first at the beginning of the game, it is determined by the player picking either the Agumon coin or the Betamon coin, with one of the coins chosen randomly. The deck will be shuffled automatically, then both players draw from their respective deck up to 4 cards in hand. The players may discard the cards and draw 4 cards again if necessary. Both players should select a Digimon Card from their hand and place it on their Digimon Slot; in this case Level III (Child) Digimon is usually preferred. If Level IV (Adult) or Level 完 (Perfect) is selected instead, their HP and attack points are halved or quartered, respectively. If there is no Digimon card in hand, the player must discard their hand until a Digimon is selected. After that, the player may use a Digimon Card to increase the Evolution Points (POW) as the evolution requirements, which is useful to make the Digimon stronger. The requirement is determined by the POW required on Level IV or Level 完 Digimon cards (Level III does not have POW requirement). Normally, the evolution can be done if the Digimon's specialty and its evolution's specialty are the same. The player may also use an Evolution Card, such as Speed Evolution, to make it easier for his Digimon to evolve. At this point, both players select either Circle, Triangle, or Cross as their attack. Circle attacks usually have the highest damage, Triangle attacks usually have mediocre damage, and Cross attacks usually have the lowest damage, but generally have special effects, such as lowering the enemy's Circle attack to 0. The player may then select a card from his hand or the top of his deck as his Support Card or Option Card. After his Support or Option effects are resolved, the battle begins and the damage are calculated to the Digimon's HP. The player is a winner if he defeats three of his opponent's Digimon, or the opponent is unable to select its next Digimon before the rounds ended. The player may receive one of the three cards offered and Bits (money) as reward. The Village of Beginnings (はじまりの街) is the village near the center of File Island, where Babamon and Betamon resides. The Unwavering Forest (迷わずの森) is a forest with many digital trees and plants plugged in to outlets, and is known for its huge lake. Drill Tunnel (ドリルトンネル) is a tunnel which connects the Unwavering Forest to Gear Savannah. Mount Panorama (ミハラシ山) is a mountain with spores and a great view over Gear Savannah. Beetle Land (ビートランド) is a land of insect-type Digimon across from the lake in the Unwavering Forest. Gear Savannah (ギアサバンナ) is a huge plain with various trees, where many Digimon are known to gather together. Factorial Town (ファクトリアルタウン) is a factory town that builds up machine and takes them apart again. Geko Swamp (ゲッコー湿地) is a wetland rumored to contain a palace where the ruler of the swamp resides. Misty Trees (ミスティツリーズ) is a forest covered in a thick fog all the time, where travelers can easily get lost. Freezeland (フリーズランド) is a frigid location where snow falls each day. An icy temple provides shelter and reprieve to those who are granted entry. Great Canyon (グレートキャニオン) is a canyon with very dry and hot weather. Recently installed elevators allows travelers to traverse up and down the canyon grounds. Overdell (オーバーデル) is a grim and dark wasteland where a royal mansion stands tall, with a cemetery serving as its front yard. Tropica Jungle (トロピカジャングル) is a jungle with humid weather, with an annoying atmosphere consisting of buzzing noises and the screams of tribesmen. Ancient Dino Region (ダイノ古代境) is a humid and desolate area inhabited by many dinosaur-type Digimon. Many cards are excavated from here, with the Bug Card being one such card. Infinity Mountain (ムゲンマウンテン) is a large mountain located at the center of File Island, where only the strongest of Digimon reside. Only those who hold the seven "7s" cards are granted entry to the mountain's core. This game is often confused with Digimon World: Digital Card Arena, as the US version of Digimon World: Digital Card Arena uses the name Digimon Digital Card Battle. The First Pressing of this game came with a Lenticular Hologram of Metal Greymon (Virus) and the card Dw-2.